Severn Valley Railway, a heritage steam railway running on 16 miles of standard gauge line through the Severn valley from Bridgnorth to Kidderminster, following the course of the River Severn for much of its route. 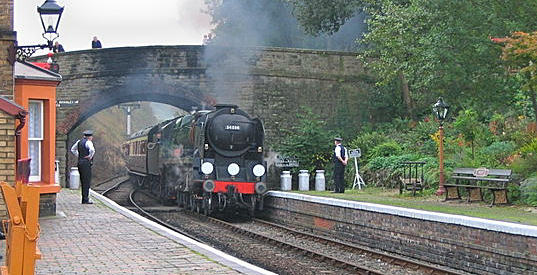 The SVR's rail connection to the National Rail network at Kidderminster permits occasional through charter trains to operate from many parts of the country to Bridgnorth. In the summer of 2007 it was badly damaged by floods, but by mid 2008 was restored and fully open again. It operates mostly steam locomotives but also some heritage diesels, and is one of the countries most popular lines. This railway has featured in a number movies and TV series including the 1990s sitcom Oh, Doctor Beeching, and ITV drama, Goodnight Mr Tom. Bridgnorth The only station building with any form of listing. Eardington Halt, originally just Eardington (Closed in 1981, used only for storage, a few volunteers have campaigned for re-opening in recent years). 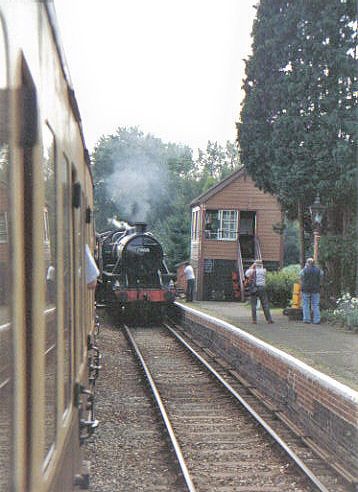 Alveley Halt (Never re-opened by SVR after BR closure, due to it serving a now closed mine, and the opening of the new Country Park Halt). Kidderminster Town station is a reconstruction, based upon the original GWR station at Ross-on-Wye (1892). With the exception of Country Park Halt and Northwood Halt, all of these stations can handle two trains, allowing trains to pass in stations. 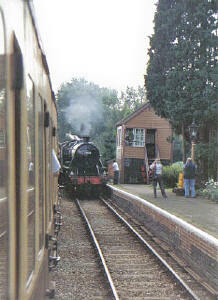 Highley's passing loop has sidings leading off it with points not controlled from the signal box, meaning trains with the travelling public on may not use this loop. However, it is frequently used for works trains, demonstration goods trains and empty stock workings. 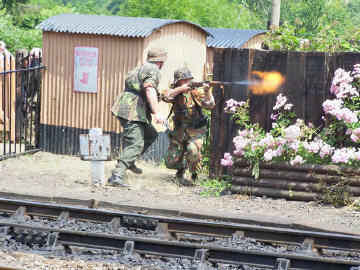 Despite this, the Severn Valley Railway offers, possibly, the most intensive service on any single line heritage railway. A short section of multiple track exists between Bewdley South and Bewdley North signal boxes. 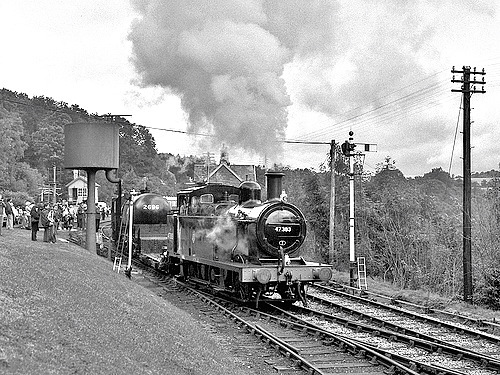 The main locomotive works is located at Bridgnorth but is not normally open to the public because of health and safety regulations but conducted tours and open days are arranged from time to time. Major features of the locomotive works include the Boiler Shop equipped with overhead crane, Noble and Lunn wheel lathe and ex-LT lifting jacks. Carriage repair and restoration is carried out at a number of locations on the railway, the main carriage works is located in the former goods shed at Kidderminster. This building, lying adjacent to the main national railway line, is known as the North Star Carriage Works thus perpetuating a typical GWR name. As well as having a machine shop and fabrication equipment to carry out a full range of body and bogie repairs the carriage works boasts equipment recovered from former BR works to calibrate and adjust dynamo voltage regulators and to thoroughly overhaul and test vacuum brake equipment, a facility that is almost extinct elsewhere. In common with the locomotive works it is not normally open to the public due to health and safety legislation. 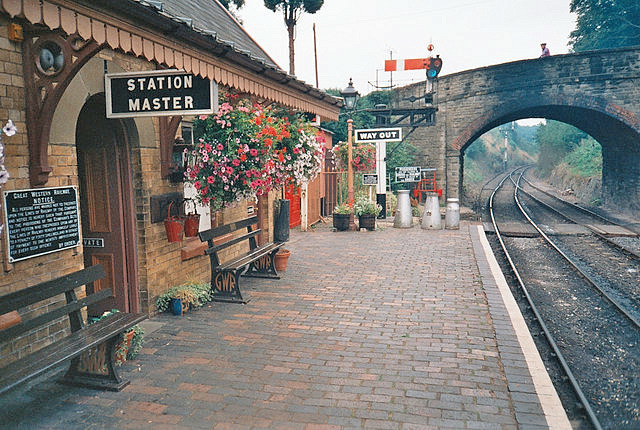 A museum, known as The Engine House, has been built on land adjacent to the station at Highley. There are possible plans to extend the line north. The SVR have been offered first refusal by British Rail on the all-important tunnel under Bridgnorth as the first essential part of the plan. Telford Steam Railway have plans to expand towards them perhaps one day joining up the two lines, but there are a number of obstacles to overcome to make this possible. There are possibilities of extending in a number of other directions as well. There are approaching 30 steam locomotives based on this line plus around a dozen diesels, some in each case being restored. Being one of the earlier steam preservation railways they have also been able o collect a very wide range and extensive collection of carriages and wagons. This includes at least 6 full sets in different liveries. You can see the route by clicking here, from this page you can also download a route guide that you could print out, this has 9 pages of route information a cover and 4 other pages including a membership form. It is informative but scan quality is poor presumably to cut the download size. On the route page you can see some photos and more by clicking on arrows under them. War Weekend Battle Re-enactment - special events open up more photo opportunities. From a photographic perspective this line is picturesque, has a number of interesting features and passing trains. There are many bridges and access points from which the railway can be photographed, the downloadable line guide used with an OS map would open up many. I have ridden on the railway but although not far from me have not explored the route and looked for photographic opportunities. For much of the way the railway follows the river course, and as there are footpaths along the river, there are many places that the railway can be seen. There are many bridges over the railway and a number of footpaths that run parallel further up hillsides, that may give good views. This would be an interesting railway to produce a detailed photographers guide to the best locations. I must get around to doing this at some time, unless of course you would welcome this challenge. Lineside passes are available and cost £25pa. The information is not on the website on this, but if you contact them they will send you a form to complete and sign. Using a lineside pass in combination with unlimited travel tickets you could move about this line getting a selection of good photographic opportunities. Image right, was converted to black and white in CaptureNX2. Specialist emails and forms on website but no general one. 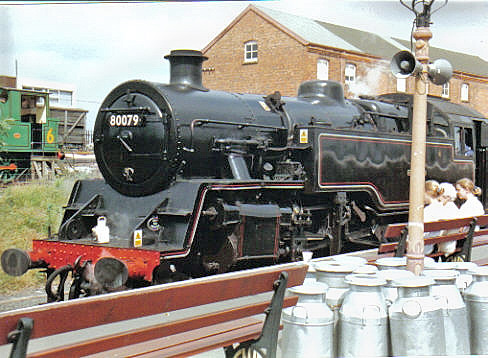 Other Relevant pages: The Telford Steam Railway Wiki (may join up with in the future, see above). Satellite Navigation: Kidderminster Station, Comberton Hill, DY10 1QX. Located at Comberton Hill, the A448 Kidderminster-Bromsgrove road and is signposted from Kidderminster Ring Road, the A449 Worcester-Wolverhampton road. It is also signposted from the M5 Junction 3 southbound and northbound and M5 junction 6 northbound. Follow the brown tourist signs depicting the little steam engine. Satellite Navigation: Bridgnorth Station, Hollybush Road, WV16 5DT Situated in Hollybush Road on the west side of the River Severn and is signposted from the A458 Birmingham-Stourbridge- Shrewsbury road and the A442 Telford-Kidderminster road. Difficulty parking, narrow lanes etc. The Severn Valley Railway operates ‘pay & display’ car parks at Kidderminster and Bridgnorth. Parking at Bewdley Station is currently free of charge. See their timetable showing dates and times, you can also download a PDF timetable from this page. Fares for individual journeys and unlimited travel for the day are available. Unlimited: Adult £13, Children £6 and Seniors £11. A combined ticket with entry to the Engine House Museum is also available. Special events have different charges.